Homes for Sale in Aliante. Aliante, Las Vegas is a master planned community in North Las Vegas, just 20 minutes from the excitement of the Strip, but worlds away with living luxuries. Located where the desert and the Las Vegas foothills merge, residents can enjoy Aliante’s high-efficiency homes engineered to save energy, bask in the beautiful landscape and benefit from Nevada’s favorable cost of living. 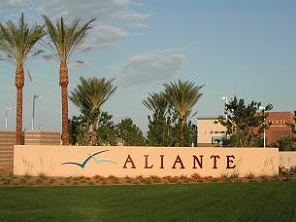 Aliante casino is close by this beautiful neighborhood. Contact Tracy Drown for real estate 702-245-9341. Terrasini is a Great Community w/a Playground, BBQ Area, Community Pool, Volleyball and Basketball Court. The unit has an Attached 1 Car Garage, Tile throughout w/Carpet in the Master Bedroom, Attractive Kitchen Including Necessary Appliances. The Community is conveniently located by a Walmart, Costco, many Restaurants, also, right next to the 215 Hwy for Easy Access to Nellis Air Force Base. Location, Location, Location! Must See 1st Level, 1 Bedroom - 1 Car Garage W/Access Access To Home - Pet Friendly Gated Community. Ready To Move In xD; xA;New AC, New Water Heater & Upgraded Washer and Dryer Stays! Beautiful 1 B/R condo w/ attached 1-car garage in gated Aliante Community by Pulte. Unit was used as a vacation home & has tile throughout except for bedroom. All appliances included. Amenities include community pool, fitness center, basketball court, playerground.etc. Conveniently located, only 1 block to 215 beltway, close to Costco and Target. NO SID!!!!! Get it while its hot!!! 1 B/R spacious condo located in the beautiful Terrasini community at Aliante! Tile flooring throughout, no carpet w/ attached 1 car garage and all appliances included. Take advantage of all Terrasini has to offer: pool, fitness, basketball, playground. Conveniently located near 215/Decatur shopping centers! Hardly used, immaculate vacation home, true pride of ownership. Flooring in main areas are tiled, Only carpet is bedroom. Enjoy morning coffee in your private covered patio with mountain view. Kitchen includes breakfast bar and nook. All appliances will stay. Easy access to your home with the attached garage. Short distance to Walmart, Costco, restaurants, shopping and freeway. Community features: outdoor pool, playground, BBQ area & more. Move in ready! New paint throughout, new carpet in the Master, tile throughout the living room and kitchen. Kitchen has breakfast bar/counter. All appliances stay. Quick and easy access to I-215, shopping, dining. Direct entry into home from the garage. Community includes pool, basketball court, volleyball court, BBQ, dog parks, several stands with bags for picking up after your dog. LOVELY ONE BED/ONE BATH DOWNSTAIRS CONDO. ALL TILE FLOORING IN LIVING AREA; CARPET IN BEDROOM. WASHER, DRYER, FRIDGE INCLUDED; CEILING FANS THROUGHOUT. VOLLEYBALL COURT VIEW FROM PATIO. INCLUDES ONE CAR GARAGE. PERFECT FOR YOU TO MAKE IT YOUR OWN! This one bedroom condo is located on the first floor of the beautiful, master-planned community of Aliante. It has a private, one car garage with entry to the unit. Corian countertops, breakfast bar, and open floorplan with a patio off the living room. Come check it out!